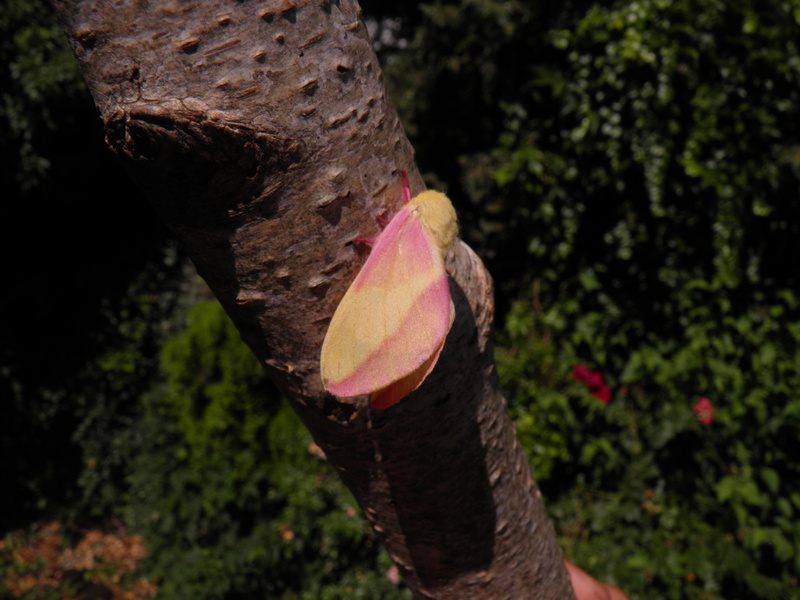 Dryocampa rubicunda — “Rosy maple moth” | Welcome, visitor! 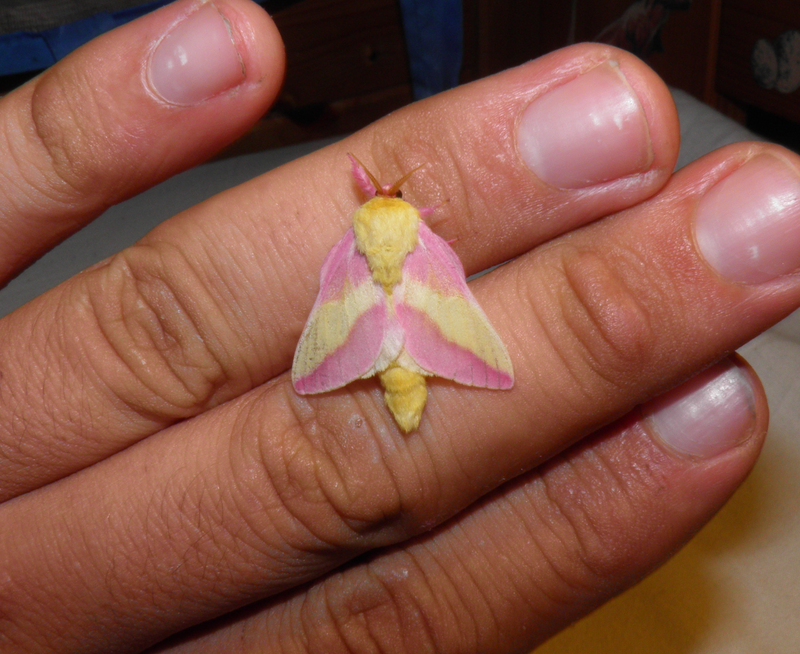 Dryocampa rubicunda, also known as the rosy maple moth, is one of the smaller Saturniidae (silkmoths) and no doubt one of the cutest. They can be found in Canada and the eastern United Stated of America. 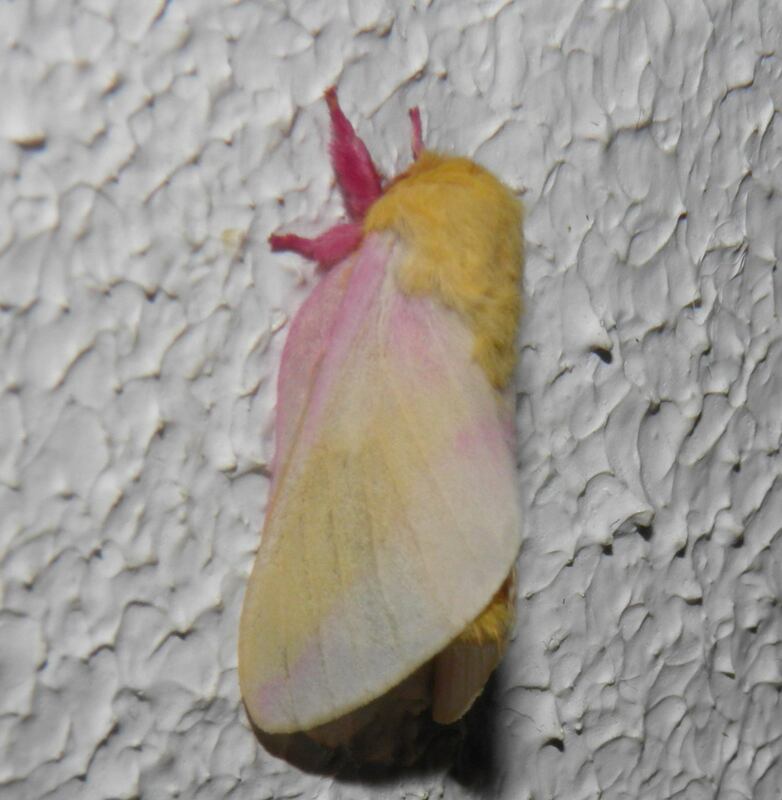 As the “rosy maple moth” name implies, Dryocampa rubicunda mainly feed on maple tree (Acer) and seem to rely on several species of maple. Dryocampa rubicunda can have multiple broods per year, but this strongly depends on the geographical location. The most northern populations, such as in Canada, only have one generation a year – the pupae will hibernate and will lay dormant until the next spring. However, in the deep south, in states such as in Florida, these moths produce up to three generations a year. This means that they will produce more generations as long as the local climate allows it, triggered by environmental conditions such as temperatures and daylength, and may produce more generations than usual in captivity. However, at some point they will always hibernate. Their favorite host plants is Acer saccharum, also known as sugar maple, although they seem to accept many kinds of maple trees in the genus Acer. They are occasionally also recorded on Quercus sp. 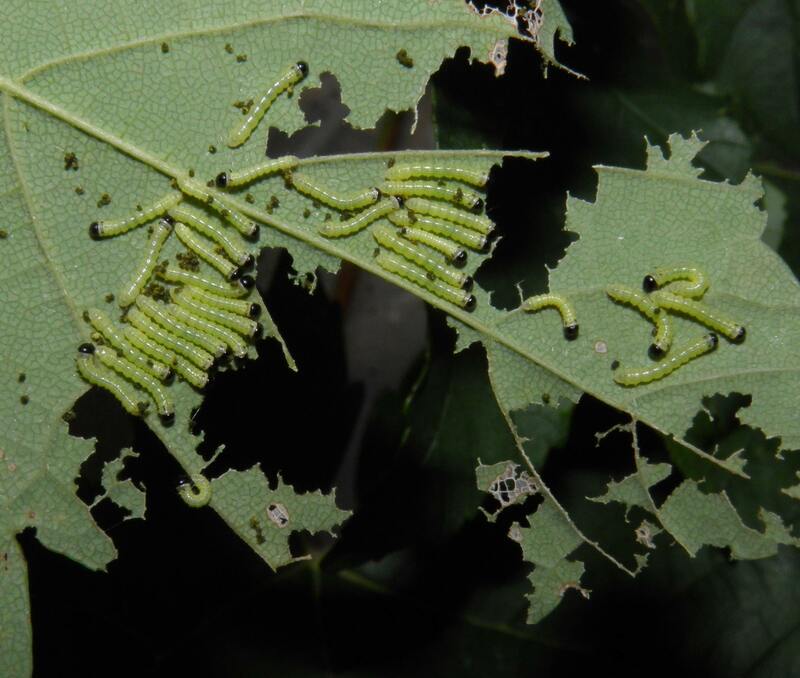 – oak trees – in the wild but oak seems to be a suboptimal host plant, and in captivity the caterpillars show a higher mortality rate if raised on oak. 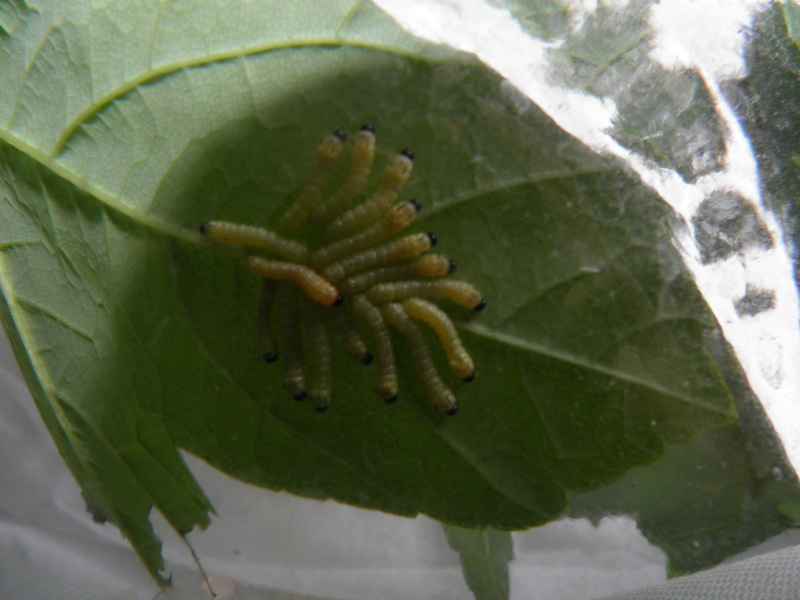 Young caterpillars (instar 1 t/m 3) are social and can be found in groups while larger larvae (instar 4 t/m 5) become solitary. Larvae pupate in the soil after burrowing and do not spin cocoons. Their wingspan around 2 to 3 centimetres, which is exceptionally small for a Saturniidae. Adults are usually pink – usually that is – and a yellow form has also been recorded (D. rubicunda ‘alba’). 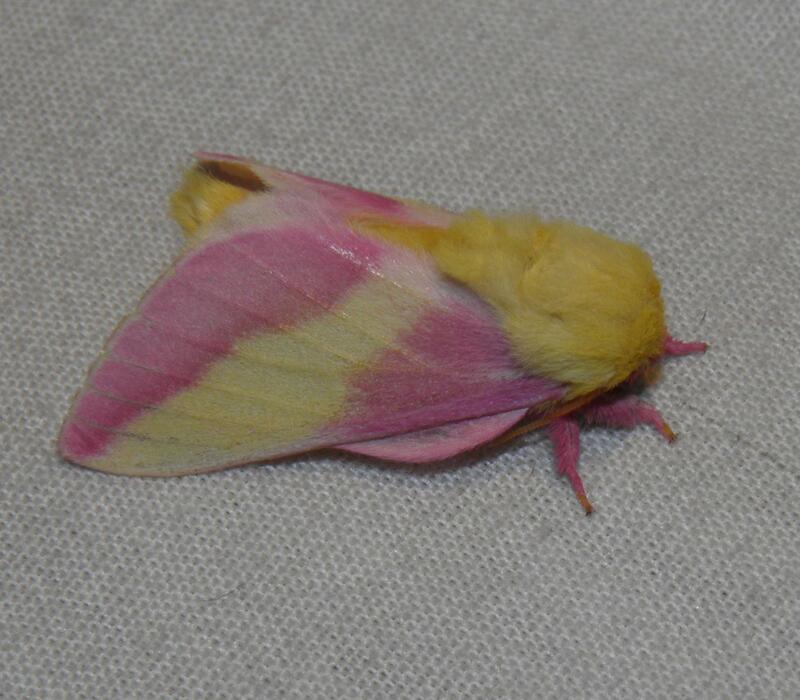 This form has pale yellow to white adults that have barely any to no pink scales at all on their wings. This form is generally only encountered in the most Northern populations, in and around the border of Canada. 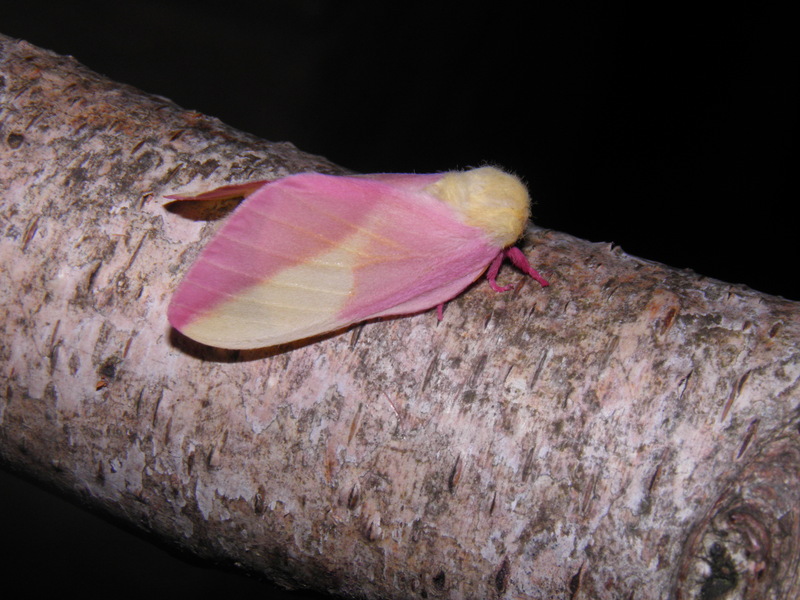 In some cases the moths of this pale form can be completely white or yellow, but usually they have reduced barely visible pink. Polyphagous: Yes, but not very, they are picky eaters. It is more of a specialist that feeds on maple tree [Acer sp.] – they are also reported to eat oak in the wild and in captivity [Quercus] but with bad result. 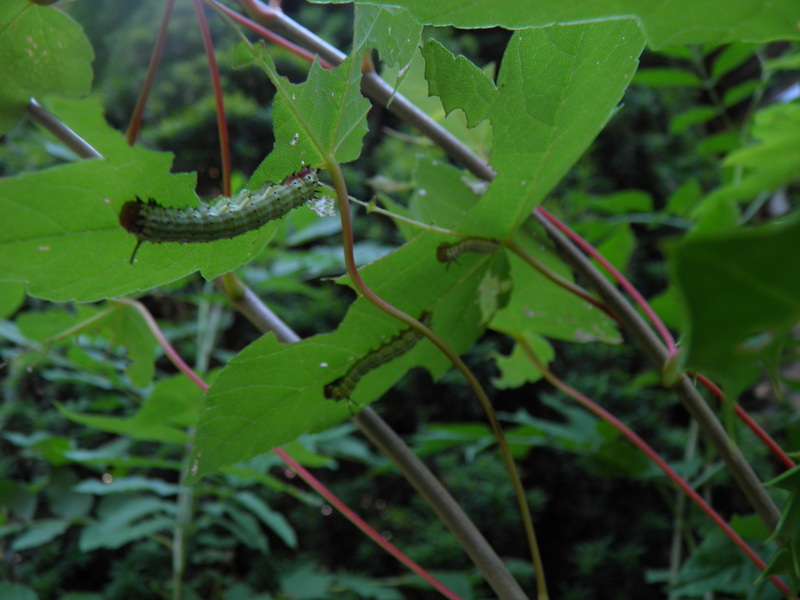 It will try to feed on most species of Acer sp., but it prefers Acer saccharum. Generations: Univoltine to multivoltine – usually only one generation a year, second generation is possible in captivity and in warm years in the wild. 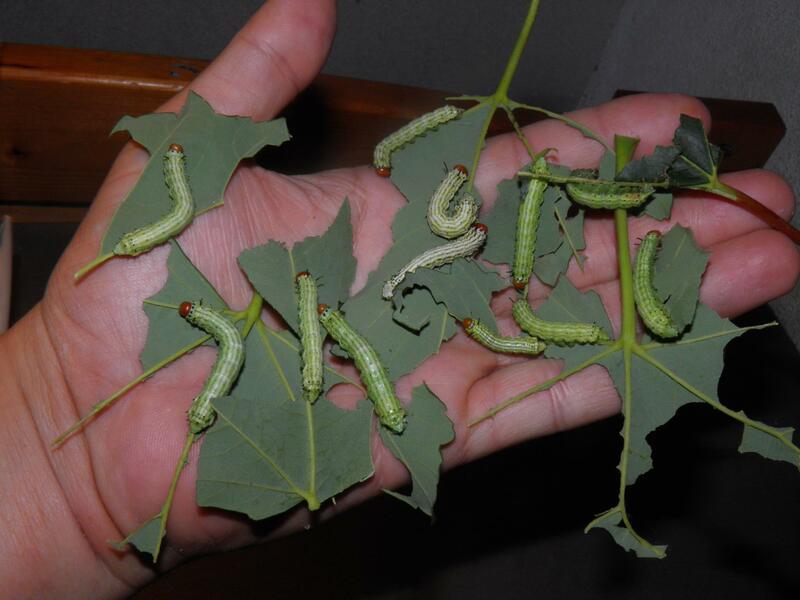 Special notes: They seem to be more picky than most Saturniidae, and trying anything else than Acer saccharum is not the best idea – though other Acer species may work well. 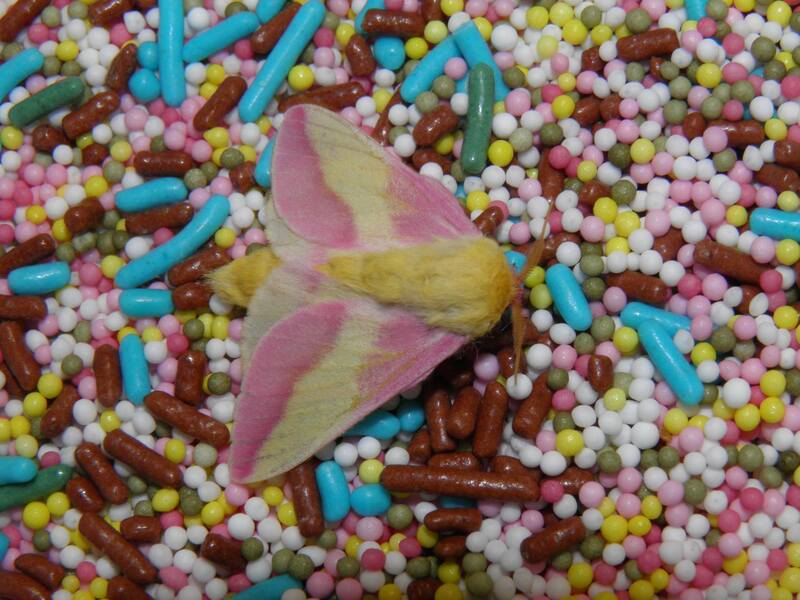 Dryocampa rubicunda, the the rosy maple moth, is moth that occurs in North America and parts of Canada. They are mainly found in the eastern part of the US, from Florida to Canada. The favorite host plant of Dryocampa rubicunda is maple, with sugar maple (Acer saccharum) yielding good result in captivity. 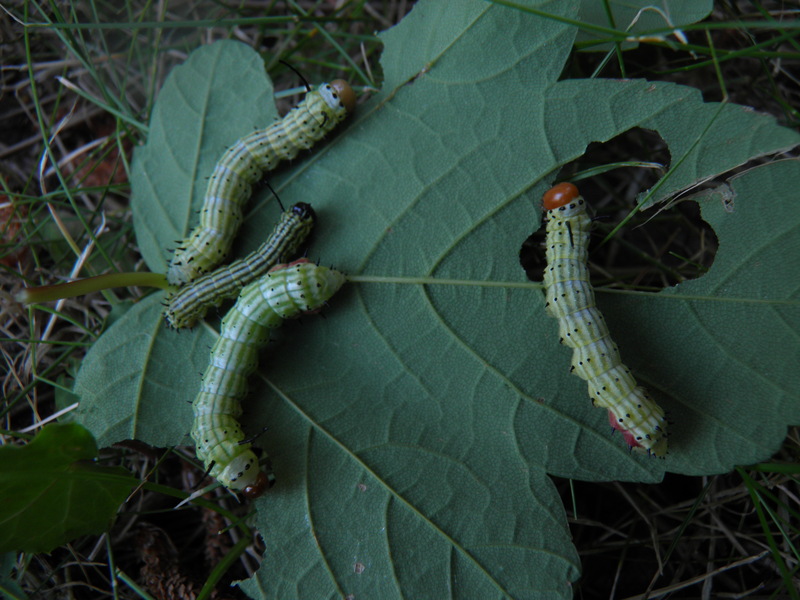 Larvae of Dryocampa rubicunda are gregarious – they feed and travel in groups. However, in the later instars, the mature larvae become solitary. From my experience they do need a little ventilation and are best reared sleeved or caged. I had great succes sleeving them on Acer saccharum in my garden. It seems they are easily able to handle cold and even rain, as long as they are properly ventilated. In my opinion one should not attempt to raise them in plastic boxes ever, since they can become infected quicky in such airtight environments. 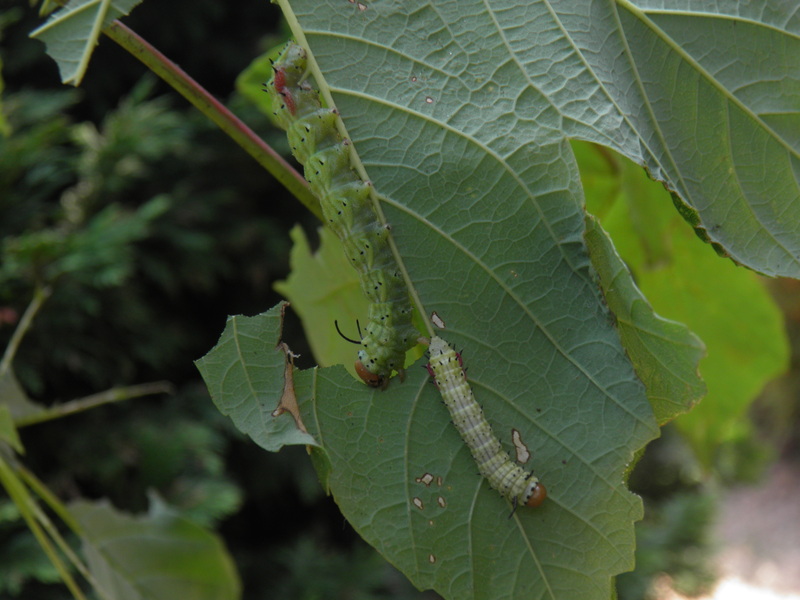 The caterpillars are green and range from nearly white to lime green and have dark stripes running over the length of their body, also giving them the common name “striped mapleworms”. This species has also been reported to feed on oak (Quercus); though rearing this species on oak may be a possibility, I would not recommend it for optimal result, only if you are somehow unable to locate maple tree. However, for stress-free and potentially easy breeding, Acer saccharum – or other kinds of Acer are recommended. Acer pseudoplatanus, rubrum and saccharinum are also succesful. The fully grown caterpillars are rather small (around 4cm to 6cm in size) because it is a small species. After feeding for about 1 to 1.5 months, the caterpillars are ready to pupate. At this point in time they will burrow in soil and form a pupa. They do not spin silk cocoons. Pupae are tiny, black and have small spines. 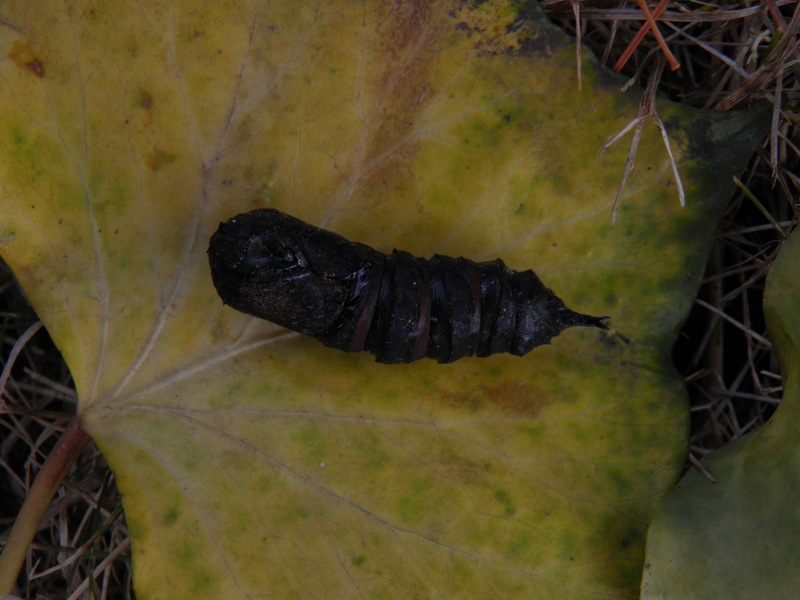 Depending on the duration of daylength experience as larvae and temperatures the pupae may or may not diapause. Pupae can be stored cold during winter in a reasonably well isolated environment. While they occur even in Canada where winters get very cold (-20C) one should keep in mind they are normally protected from such harsh cold because they pupate underground. 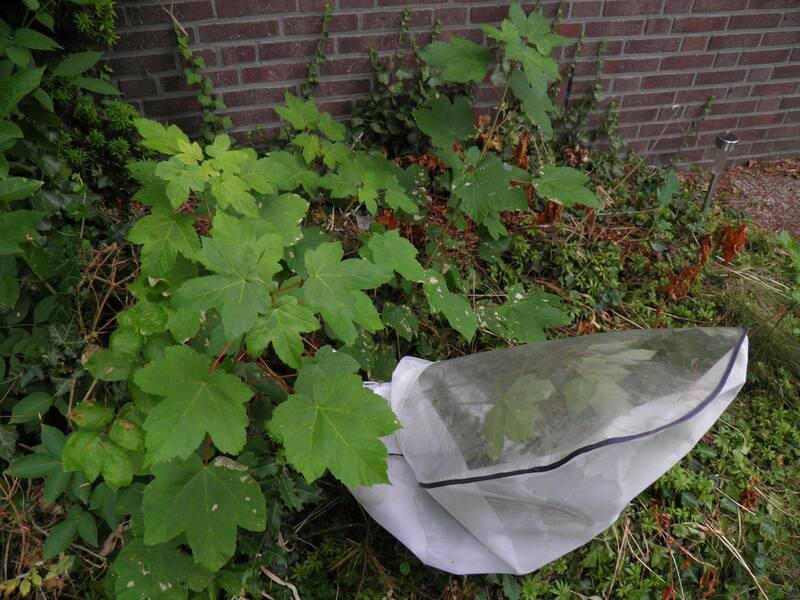 Isolate them well when overwintering them – soil, leaf litter, towels, moss or vermiculite can be used to archieve this. The adults are rather short lived and live for about a week or less, females slightly longer than males. Males are active at night and are attracted to the pheromone of the female. Their lifespart is very short for a Saturniidae, althought this is to be expected of one of the smallest Saturniidae in North America. Females seem to lay 50 to 150+ eggs. Eggs of this species hatch in 10 to 15 days. This species hibernates in the pupal stage. 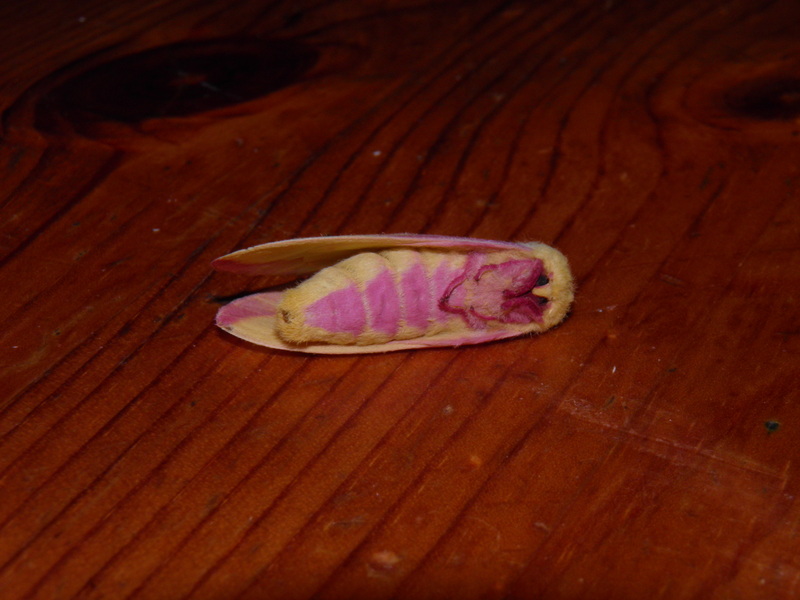 Unhatched pupae can be kept cold in winter and will usually hatch next spring. Their wingspan is about 20mm-35mm and if disturbed they can retract their legs and play dead. Although pink may seem like a conspicuous colour to us, they can be quite well camouflaged in the right environment – especially between the red to pink maple leaves. To succesfully pair them it is best to have higher numbers to increase your chances, since the adults are short lived. They can be paired in well-ventilated netted cages/aerariums. A photo I couldn’t resist making.. because they look like candy! One of the more yellow Dryocampa rubicunda alba, some specimens can be entirely yellow with no pink at all.